Captain Emanuel White’s office contains history not only of Virginia Wesleyan College but also of a man who has lived his life filled with color and vigor. He has a grandfatherly demeanor, authoritative yet kind. Sitting in his creaky chair, he can’t believe that his impending retirement is newsworthy. 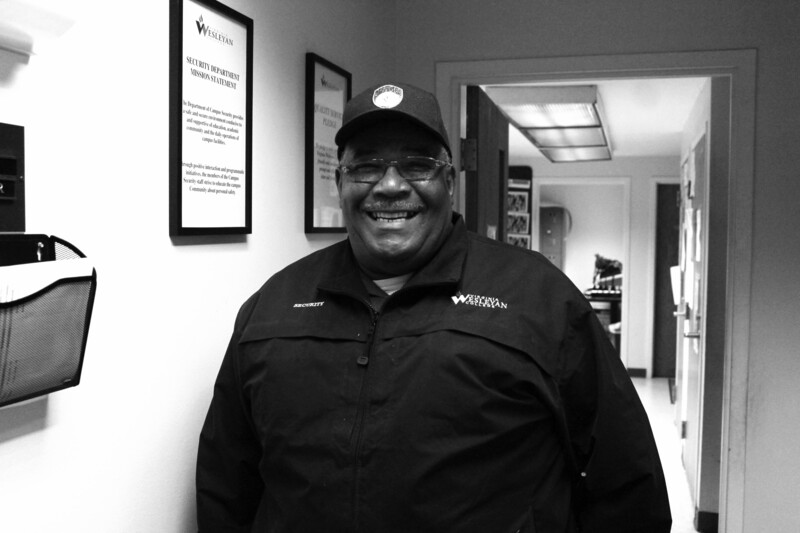 The Captain, also affectionately called “Daddy White,” says that it is time to move on from Virginia Wesleyan College after close to 18 years of service. “Ever since I’ve been here, I’ve given 120 percent. And I think my 120 percent could probably be someone else’s 100 percent. To me, I went above and beyond the call of duty. I’m getting to the point where I can’t do that,” White said. His age is a huge factor in his decision to retire. “I’m 72 years old and the body is getting a little slow. So, I feel that the people here at the college, the students here at the college and the staff…I owe them more than that,” White said. He also has in mind who he’d pick to be his successor. “One of my favorite officers, simply because he does a good job and he knows the students well and the students respect him, I’m hoping that Randy Lott will be the guy to step up to where I used to be,” White said. White looks forward to devoting time to his family and church after retirement. “The next chapter in my life is to begin to enjoy life with my wife more. Also, to do some work in the church. I intend to spend a couple days a week in the church answering phones if people need help, if they want to know where the church is, service times and people who come in and need food,” White said. White intends to begin mentoring the young men of this generation. “I still think that it’s important that the young men of this world, [have] someone to show them and talk to them and let them know how to be men,” White said. White says he specifically would like to reach out to young men of color. “I’m not a racist so it doesn’t matter to me if you’re black or white, but of course I particularly want to talk to young black men because every time I look at the T.V., I see them going to jail or I see young people completing college and then getting killed. It needs to stop and I think the only way that it is gonna stop is if we older guys step up,” White said. He also acknowledges difficulties being a black man with an education. “I do know it’s hard for black men, even with an education, so I want to help guide them,” White said. Captain White values education. Although he dropped out in high school to help support his family, he credits the Navy for saving him, when he enlisted in 1962. “The Navy was a sanctuary for me. I spent 30 years there. I got out as a Master Chief. There were really no jobs in Richmond, Virginia except working in the factories, and I wasn’t going to do that,” White said. Like many young Virginia natives, he wanted to escape the confines of the Dogwood state. “I wanted to see the world and I wanted to get out of Virginia. But what ended up happening was instead of going out of Virginia, I got orders to come back to Virginia. Out of 30 years, I spent 24 years somewhere in Virginia,” White said. White worked as a Navy recruiter for many years. “I never lied to the young people who came in. I told them everything they needed to know so they wouldn’t go in expecting one thing, and then get another,” White said. After 30 years of service, the Navy retired White and he moved on to the Norfolk Sheriff’s Department. Now, he is retiring for the second time. “I’ve been working for 56 years…I haven’t been out of a job for more than six months. That’s what scares me right now because even though I have plans to do other things, I’m just worried if I’m gonna go back to work again,” White said. White is sure it is time for him to actually retire. “Ten years ago, I was talking to an older guy and I was telling him I was thinking about retiring but I wasn’t sure. He told me to stop worrying about it because ‘one day you’re gonna wake up and say, why am I doing this.’ I was walking around here about five months ago, and I realized that I’m not doing what I usually do…It’s time to go home, and I feel good about the decision,” White said.